I've been really busy ever since my kids started school just over two weeks ago! 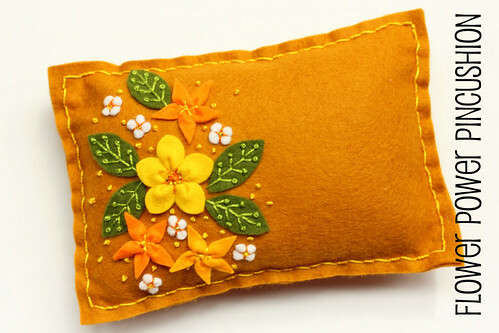 Heather from the Sewing Loft blog asked if I would join her National Sewing Month Series early on in the month... she fell in love with some vintage felt stitching kits that I had made a few years ago. I've always wanted to make my own, so I took this as an opportunity to do just that! Sometimes all I need is a little focus and I can make some of these dreams I have a reality. So today, I'm over at the Sewing Loft sharing a tutorial on how to make a Flower Power Pincushion! 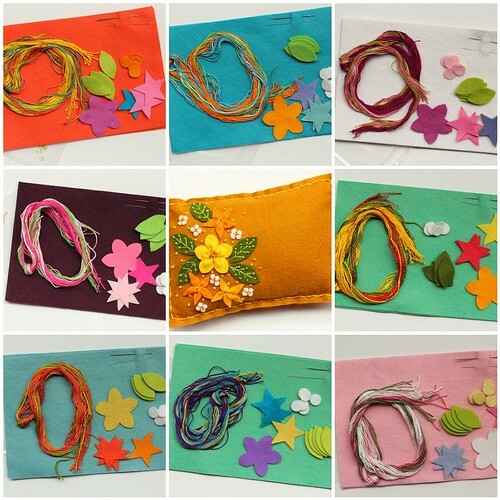 These will be so much fun to stitch up and work on your embroidery skills. I've taken care to choose pretty color combinations, high quality supplies and detailed instructions with each kit. I hope you like them because I'm excited to design some more felt embroidery kits! So fun! Those are adorable! Just lovely, going straight over to see the tutorial. Hello. I purchased your quilt top and backing a month ago, finished it, and just barely blogged about it. Thought you might like to see it. AND I love your trip around the world quilts! both of them!